The iconic designer comes out with a third installment of his culture-inspired tote bags: the cabas. After his colourful visits to Africa and Central America, Christian Louboutin came out with limited edition totes, namely the Africaba and Mexicaba. For the third installment of his culture-inspired bags, Louboutin found his way to Philippine shores. Late last year, the designer visited Manila in search for inspiration. Coincidentally, he even attended our annual Philippine Tatler Ball! In what he describes as a "mind-blowing" trip to the Philippines, Louboutin commemorates his visit with another installation of his Treasure Totes: the Manilacaba. 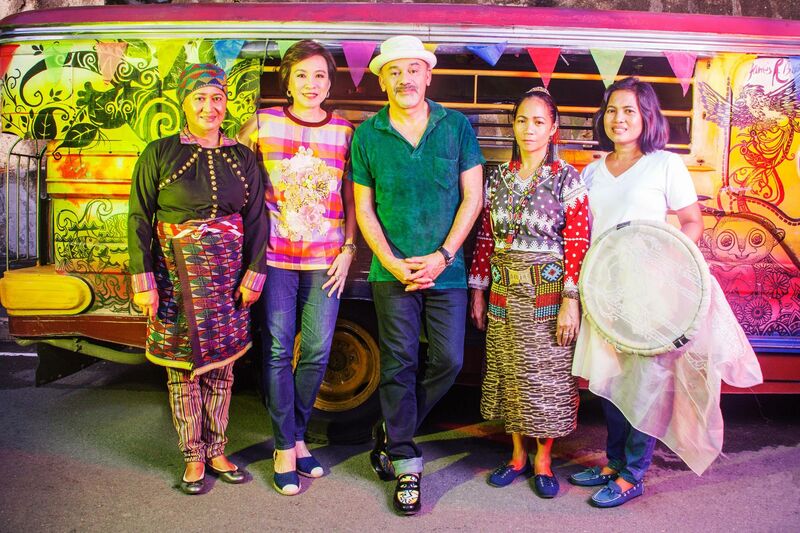 As the designer plowed through Manila's legendary traffic, the local jeepneys caught his eye. A beloved heritage of Manila, Jeepneys were once ordinary Jeeps abandoned by American troops after World War II. After the dust had settled, local people adorned them with vibrant decorations, filling up every empty space as a way to protect themselves against evil spirits. While the jeeps found their way through the dense traffic of Manila, they celebrate life with a joyful style Louboutin immediately related to. Meaningful result of an encounter, the new Cabas stands at the corner of creativity and beneficence. The partnership takes on board the GREAT (Gender Responsive Economic Action for the Transformation of Women) Women in ASEAN initiative, a platform supporting the economic empowerment of Asian women artisans and their craftsmanship from South Asia and bringing their products out to the world. "Designing the side-panels with Christian was a rich experience. The pattern Christian elaborated for them was new for the artisans who were used to weaving traditional motifs with this technique. But when we saw the encounter of tradition and creativity happen on the fabric, we thought: how interesting, we should have done this before! This is an inspiring story of mutual respect." said Jeannie Javelosa, co-founder of the GREAT Women in ASEAN initiative. For every Manilacaba purchased, ten percent of the benefits will be donated to the initiative to contribute to its development. Since 2015, the GREAT Women in ASEAN (platform empowers women entrepreneurs, providing them with training and mentoring programs to help them thrive in their businesses on a global scale. With more than 7,000 islands and many ethnic groups, the Philippines concentrate a wide variety of colours showing through the abundance of their natural resources – the lagoons’ many shades of blue, the iridescent Mother of Pearls, along with the blinding tones of seashells and sand which instilled an exclusive version of the Piloutin. The diverse cultures and traditions of the Philippines inspired Christian Louboutin to design two limited edition versions of the Manilacaba: Denim Blue and Black Satin. On the front of the Tote, sequins and cotton threads are embroidered into a playful wink to the crowded Jeepneys, which are also referenced on the lining of the bag in an eye-popping pattern that transcribes Manila’s passionate lifestyle. Around the central red frame, iridescent sequins are sewn into an eye-catching arrangement recalling the radiance of Mother-of-Pearl, a material widely produced and used throughout the Philippines. Finally, the Cabas’ handles carry Christian Louboutin’s unmistakable signature spikes, a bold statement spicing up the signature tote! The Piloutin honours the natural wonders of the seas surrounding the Philippines. Marvel at the islands’ treasures and plunge to the bottom of the lagoon where the crystallised Piloutin bags await you. Inspired by the shimmering seabed, they are ornamented with brilliant Swarovski crystals and beaming with pearlescent shells. Swim through the pristine waters and explore the multicoloured wilderness of the coral reefs to discover the sea-flower Artemistrap, a delicate pink anemone. Gently floating on a floor of stones and pearls, it utters lightly as the tide brushes its fluffy filaments. Hurry! With only 10 one-of-a-kind Piloutin bags and 10 Artemistrap available worldwide, these rare collectible pieces will be gone before the next tide withdraws. As always, the designer takes a unique inspiration and transforms it into a beautifully crafted piece of art. Bringing together style, elegance, and inimitable technological prowess, Louboutin continues to inspire and reminds us of the allure of our country's own natural resources.